Its official – I’ve got the fever. No, I am not sick. But I have got SOUP FEVER! Sorry that is so lame, I know – but it’s true! I am love love loving soup right now. After enjoying a nice hot bowl of my Crockpot Turkey, White Bean, Bacon Chili two weekends ago, and then ANOTHER amazing bowl of Butternut Squash Soup this past weekend – you’d think I’d be sick of soup already! But no, all I want is more soup! This week I’m thinking I’d still like something which makes additional cheese consumption appropriate. However, I want the recipe to be light – not too heavy. Nothing with cream. Something packed with protein and flavor. 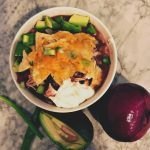 One Pot Chicken Tortilla Soup – here we go! 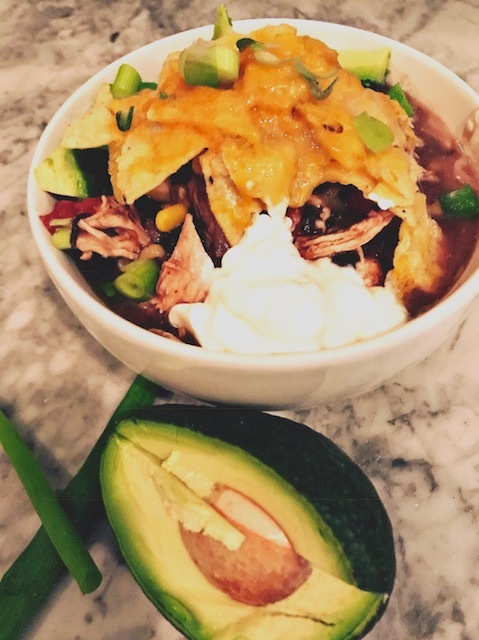 Chicken Tortilla Soup has always been a cold weather staple in our house. It is SO easy to make and SO delicious. Rich tomato broth filled with chunky tomatoes, sweet corn, delicious black beans, melt in your mouth chicken, and PLENTY of spice. It’s interesting because the seasoning in Chicken Tortilla soup is rather similar to that of some chili recipes – but it tastes SO different! The best news about chicken tortilla soup – its for sure a vehicle for all those yummy soup toppers. 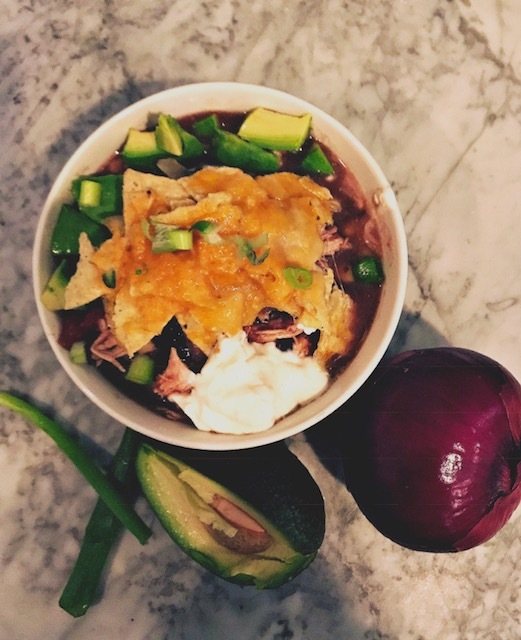 Cheese, sour cream, red onions, green onions, tortilla chips, avocado – you cannot go wrong people. I often make this soup with raw chicken – but it is a GREAT recipe for leftover chicken. Maybe you had a rotisserie chicken earlier in the week and the family is tired of it – peel the chicken right of the bone and throw it in the crockpot. All set – good to go. In the recipe below, I suggest to season and cook the onions and chicken together in a large pot before adding all additional ingredients to cook. I like to do this because I think the chicken absorbs additional flavor from the onions and seasoning which tastes amazing later on. However, if you’d like to use a crockpot for this recipe, you can use cooked or uncooked chicken! Just make sure you wait until chicken is thoroughly cooked before tasting the soup! If adding cooked chicken, shred before you put it into the soup. If adding raw chicken, remove from soup about 30 minutes before soup is completely ready, shred chicken and add back into soup! Of course when the soup is finally ready, top with all those delicious extras! Raw red or green onions, avocado, sour cream, jalapenos, and my favorite – tortilla chips! Chicken soup just got a Mexican twist! This flavorful soup is chock-full of chicken, black beans, corn, and tomatoes then seasoned with cumin, chili pepper and cayenne. 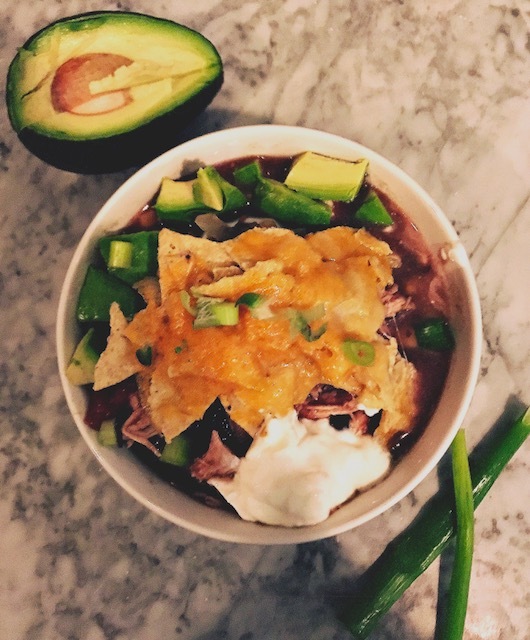 Top with cheese, avocado, sour cream, and tortilla chips for the perfect cozy weekend or weeknight meal! In a large pot, heat oil over medium heat. Add chopped onions and cook for 4-5 minutes until softened - stir occasionally. Slice chicken breasts in half, width-wise (this will decrease cook time), then season with 1/2 teaspoon of cumin, 1/2 teaspoon chili powder, salt and pepper. Add seasoned chicken to pot with onions. Cook chicken 5-6 minutes on each side, or until browned on both sides. Remove from heat and set aside to cool. Once chicken is cool enough to touch, shred with a fork, then place pot back over medium heat. Add all remaining ingredients to pot - stir to combine. Allow soup to come to a boil, then lower heat to simmer for another 25-30 minutes. Continue to add salt, pepper, and additional lime juice until the taste is as you desire. Enjoy with cheese, avocado, sour cream, green onions, red onions, fresh tomatoes, tortilla chips, quesadillas or whatever else your taste buds desire! Storage: Once completely cool, refrigerate in an airtight container for up to one week. Freeze for 2-3 weeks.